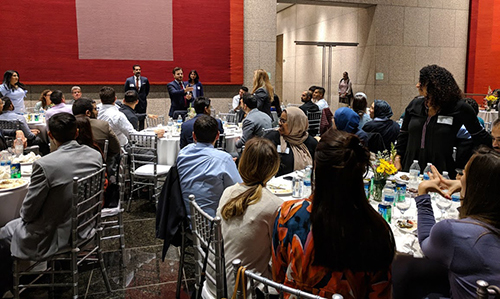 Glaser Weil LLP was privileged to host an iftar — the meal eaten by Muslims after sunset during Ramadan – in conjunction with the Muslim Bar Association of Southern California. Sixty lawyers and professionals gathered on May 24, 2018 in Glaser Weil’s downtown Los Angeles office for this culturally significant breaking of the fast. Amin H. Al-Sarraf, a Glaser Weil attorney and co-president of the bar association, was the driving force behind this collaborative event. After the success of the evening, he hopes to make this an annual occurrence. Established in 2007, the Muslim Bar Association of Southern California has created a budding community of Muslim legal advocates and practitioners. To learn more, visit www.mbasc.org.